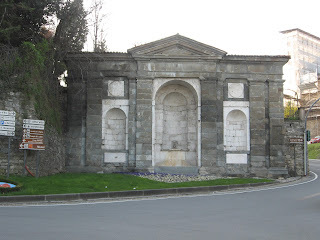 The grey, sandstone Porta Sant’Agostino is the most popular way of entering Bergamo’s Città Alta (upper town). Buses and cars from the Città Bassa (lower town) will climb Viale Vittorio Emanuele II and pass under the gate’s central archway before turning left and travelling along Viale delle Mura. 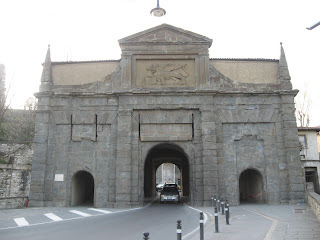 Pedestrians can use the smaller archways at the side to enter the Città Alta and walk along Via Porta Dipinta to reach Piazza Mercato delle Scarpe. From there the ancient Via Gombito leads to Piazza Vecchia in the centre of the upper town. Porta Sant’Agostino is believed to have been designed by Paolo Berlendis and was built in 1575 during the huge project to improve the fortifications of the Città Alta. The stone carving of the Venetian lion over the central archway was added more recently to replace earlier insignia that had been removed by invaders. The beautiful fountain behind Porta Sant’Agostino was built in the same style as the gate later in the 16th century for the benefit of travellers arriving in the city.